The colonial house at 10 Wicks End Lane sits on a property of just over two acres on a quiet cul-de-sac in the Cannondale section of town. WILTON — Those who may be at their wit’s end, searching for the ideal home might want to take a drive down Wilton’s Wicks End Lane, a quiet cul-de-sac in the Cannondale section of town where they just might find what they are looking for. Although the clapboard and red brick colonial house at 10 Wicks End Lane was built in 1984, it offers a long list of attractive modern features inside its 6,681 square feet of living space and outside on its largely level property of just over 2 acres. Inside, it contains 11 spacious rooms including a luxurious master bedroom suite with a private balcony, a guest suite with a balcony of its own, and eight bathrooms — five of those full. Outside, there is a Gunite salt water in-ground swimming pool and spa that spills into the pool, an outdoor shower, and a hidden court for sports enthusiasts. Salt water pools do not require the amount of maintenance that a standard chlorine pool does. Indoor-outdoor living is enhanced by the large Trex deck and bluestone patio incorporated into the professional landscaping. 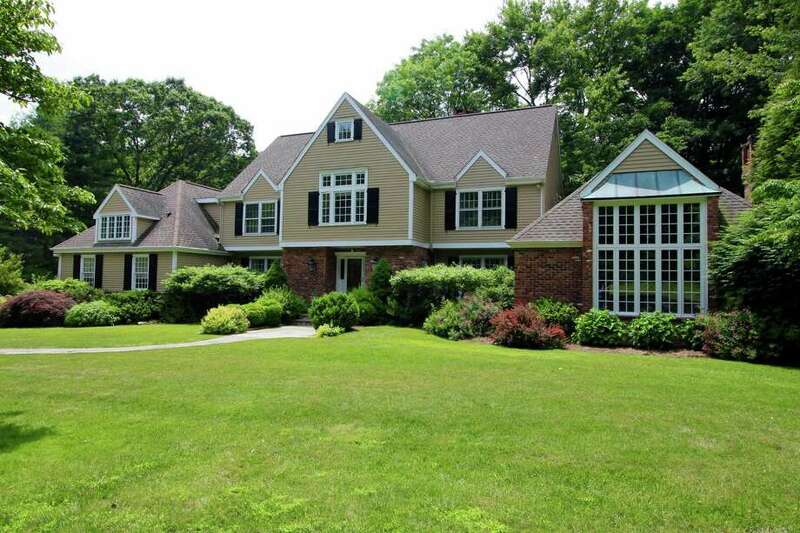 The house sits in a private setting seemingly far removed from town, but it is actually only about a five-minute ride to the center of Wilton, shopping, eateries, schools, and the Metro-North train station. The Cannondale train station is closer still. Not far from this house is Rolling Hills Country Club and golf course, and the 22-acre, 200-year-old Ambler Farm. The municipally-owned working farm offers a weekly farm stand in warm weather months for the sale of fresh, locally and organically-grown produce, hands-on educational programs, summer camp, and a number of special events. Upcoming events that the owners of this house can enjoy include the Thanksgiving Farm Stand on Nov. 19; watch the “Pumpkin Warrior” launch pumpkins down the field with a French trebuchet — or catapult, on Thanksgiving Day at noon; attend the Winter Warming Party on Nov. 30, and buy holiday trees, wreaths and roping at the annual Greens Sale on Dec. 1 and 2. A long, quarried stone wall runs the length of the front of the property. One end of the wall, next to an umbrella-like hydrangea “tree,” is topped with a lantern and marks the entrance to the long driveway lined in Belgium block. Ample parking exists in two areas where the driveway widens, including a large area in front of the attached three-car garage. A slate path travels passed the attractive landscaping along the front of the beige and brick house with black shutters and white trim. The path widens as it continues to the front entrance. The door is flanked with decorative, leaded glass sidelights and opens into the two-story foyer, which has a marble floor. Step down into the cavernous, yet elegant, two-story formal living room, which features a cathedral ceiling and fieldstone fireplace. A smaller family or sitting room has a red brick fireplace and French doors to the screened porch and then to the wood deck. It also has a wet bar, with counter space and glass shelving for stemware, adding to the already enhanced entertainment value of this house. The formal dining room is not banquet-sized but is larger than the usual. The gourmet kitchen is also quite spacious and features a large center island/breakfast bar, granite counters, and a pot-filler above the Thermador range, and French doors to the deck in the eat-in area. Stairs off the kitchen go down to a wide hall with a slate floor that lead to the laundry room, and a powder room featuring a sculptural stone bowl sink. A door opens to the driveway side. Rear stairs in this part of the house lead to a large bonus room with a cathedral ceiling and full bath. This area could serve as a family, game or play room. It also has a sliding barn-style door with a transom above separating it from a guest bedroom with French doors to a balcony. There are four more bedrooms on the second floor, including the master suite, which features a marble bath. There is also a full finished basement. For more information or to make an appointment to see the house contact Carol McMorris of Higgins Group Real Estate at 203-247-5891 or cmcmorris@higginsgroup.com.